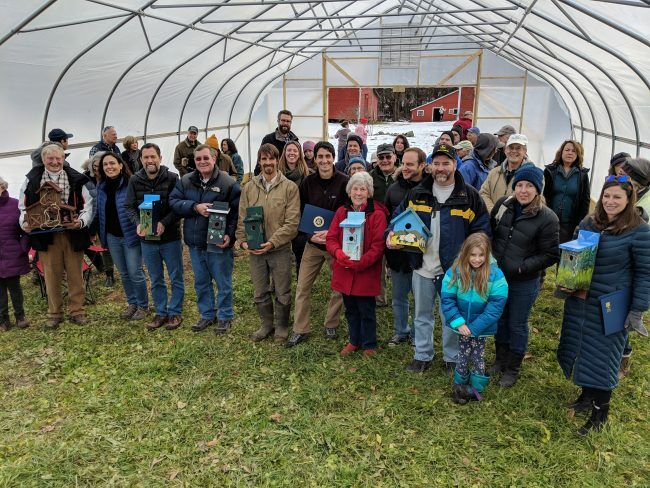 Saratoga PLAN, the land trust of Saratoga County, presented awards to seven Conservation Heroes on December 1st at the Featherbed Lane Farm, in the Town of Charlton, before an audience of enthusiastic supporters of land protection. Conservation Hero awards are given to very special people or entities that have contributed in an extraordinary way to the conservation of Saratoga County’s landscape. Conservation Heroes are recognized for their volunteer service for their communities and/or for conserving important farmland, wildlife habitat, water resources, or outdoor spaces such as parks and trails for public access. The seven award recipients were honored for helping to protect the values of their land for future generations. Wayne Wood received his award for conserving 220 acres of a multi-generational farm located in the Towns of Northumberland and Saratoga on land where the Battle of Saratoga was fought, which now nurtures crops, timber and heifers. Shirley Bold accepted her award for herself and her late husband, Jim Bold, who were instrumental in laying out conservation priorities in the Town of Halfmoon, and who put a conservation easement on their property to allow public access so that future generations could enjoy nature as they have. Douglas Meyer received his award for five years of tireless and meticulous work leading the Saratoga Greenbelt Trail project in Saratoga Springs. Geoff Bornemann, who was unable to attend, received an award for almost singlehandedly maintaining the Bog Meadow Trail in Saratoga Springs since it was opened 25 years ago. Larry Woolbright was honored for his longtime leadership of the Friends of the Kayaderosseras, and for spearheading a campaign to find a conservation solution for the 300-acre Boyhaven Scout Camp in the Town of Milton. John Munter Sr., who helped build the Bog Meadow Trail, was honored for a lifetime of engineering and construction leadership on many local conservation projects. He recently purchased the Boyhaven Scout Camp in order to provide time for the state and the Town of Milton to work out a conservation solution for the land. Local Farms Fund, represented by Kevin Egolf and Tim Biello, was honored for its mission to help farmers attain access to affordable farmland. Appropriately, the site of the awards ceremony, Featherbed Lane Farm, was purchased by the fund, and will eventually be sold at an affordable price to farmer Tim Biello and his wife Jamielynn. Each honoree was presented with a hand-painted birdhouse, decorated with scenes relevant to their award. Birdhouse artists included Benj Gleeksman, John and Chrissy Colley, Amy Smith Brown, Brooke Thievierge, Gary Beck and Trish Lyell. This is a stellar story of some stellar local people… Who are truly the stewards Of the true natural geography of the greater Saratoga Springs area. It is great to see them collectively honored like this…and it is enlightening to see what savvy and industrious people can accomplish, above and beyond their own careers and family needs, for the sanctity of our Saratoga area landscape. Thanks to all involved. Move over Superwoman, Aquaman and Batman. These are ACTUAL superheroes! POW! Some local/global heroes of mine. Oustanding stewardship of this earth. Outstanding citizens of the human race. Oustanding role models for all. We all must praise and follow their lead. Thank you all!